What you see above is entries for a race at 1 ¼ miles on the Sunday card, a two turn race at Belmont that is not named the Jockey Club Gold Cup, Belmont Stakes, or the Brooklyn Handicap. 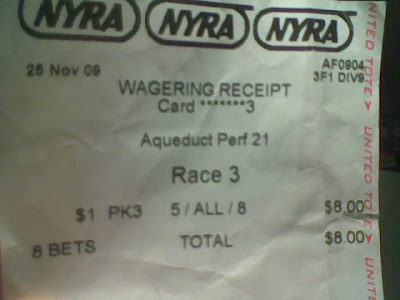 Surely this is an illusion, NYRA cannot card enough turf sprints and this is taking up space of another turf sprint. All those distance races get in the way of those magnificent turf sprints for maidens, claimers, and maiden claimers alike. Those same turf sprints that reside at least half of a late pick four on any given day and add more horses onto said pick four tickets. Yes, those turf sprints are something! The Preakness is fast approaching after the long build towards the Kentucky Derby; the connections of Dialed In will be going for a $5.5 million payday being offered for winning the Holly Bull, Florida Derby and the Preakness. If Animal Kingdom wins this race and the Belmont to become the 12th Triple Crown winner, the owner is in line for $2.4 million in total purses without any bonus. 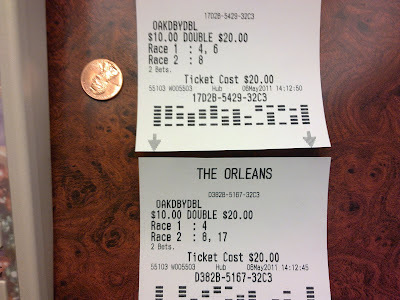 If Dialed in does win this race it is more than likely than not that Zito will chose to skip the Belmont with this one. He has stated that this horse thrives on a light schedule, a mile and a half race three weeks out from the Preakness is definitely not in a light schedule. If there were no bonus being offered for the middle leg of the Triple Crown, it is very likely that Dialed In would be training for the Belmont. Only one horse has a chance at the Triple Crown, Animal Kingdom. His explosive run in the Derby made this possible. Up until 2004 there was a bonus offered by Visa for any horse that could sweep the series and in addition to that they held a less known, but lucrative bonus for the points leader of the three-year-old division up until August of the racing season. Before Visa, Chrysler had a Triple Crown series bonus based on points with a million-dollar bonus for the leader in points for those who raced in all three races. No one is sponsoring the hallowed racing series this year, leaving a $2.9 million dollar gap in purse incentives between the three big races and the Magna purse sweetener. The old saying “Money makes the horse go” can certainly be used here; Dialed In ran an even, but distant ninth in the run for the roses. The Preakness would not be on the radar of the connections of Dialed In if it weren’t for the money being offered. Ice Box ran a visually impressive second last year in the Derby for the same trainer and same owner as Dialed In, they opted to try the Belmont instead of wheeling back in two weeks for the big race in Baltimore. This only goes to show that if there is an added incentive to run that trainers and owners will find their way to the secretary’s office a lot faster than usual. Back in the early nineties there was a series of races that offered bonuses for the handicap division called the American Championship Racing Series. Those races featured full fields with top horses facing off. If anything the slot machine parlors and card rooms probably won’t be the savoir of racing, but they do offer a new revenue stream. That revenue stream at its best can serve as a way to get horses out of the stables and back on to the racetrack. With NYRA eventually getting this new source of income, one could be hopeful that this could lead to juiced up purses with bonuses that have the possibility of attracting large fields for one of the beacons of racing in the United States. The past ten years have not been kind to the winners of the Kentucky Derby. The last great horse to win this race was Silver Charm with seven graded stakes victories following his triple crown season and his greatest racing accomplishment being a victory in the $4 million Dubai World Cup. Only three starts after the Derby (two of which were in the triple crown) and was defeated by a combined 29 ¼ lengths in those starts. Probably the most accomplished of the bunch. He won the 2004 Jockey Club Gold Cup and a few other races in his seasons following the Derby win and Triple Crown bid. Raced twice after the Derby and had his Triple Crown attempt was thwarted in the final yards of the 2004 Belmont Stakes. Was retired before the Breeders’ Cup with soundness issues. Following two distant finishes in the Preakness and Belmont; Giacomo went one for six with a win at four years old in the San Diego Handicap. Was catastrophically injured during the running of the Preakness Stakes. He showed great potential before the injury and is in the same league with Ruffian in the “what might have been” category. Won the Jim Dandy and Travers after his narrow defeat to the great Curlin in the Preakness. Managed to get four starts in before going to stud at three with 2-1-0 record out of four starts. He ended his career with two losses though, a second to Hard Spun in the now defunct Kentucky Cup Classic and a distant fourth to Curlin in the Breeders’ Cup Classic. After a record setting loss by any horse attempting the Triple Crown, he went on to win two races at Monmouth (one of them being the Haskell) and was retired after a recurring hoof injury reared its ugly head. Tried hard to match Monarchos’ record for Derby futility in a record amount of time with three losses following his moment of glory at Churchill. Super Saver far back at Baltimore, blown away by Lookin at Lucky again in the Haskell, and was tenth in the Travers. If you ever needed a shining example of a flash in the pan, this is it. Graham Motion trains this year’s Derby victor and he can stretch out a horse’s peak form for quite a while. Just from a first impression it looks like Animal Kingdom and Mucho Macho Man are probably the two most likely horses who can parlay their Derby performances into Preakness triumphs. Not a lot else looked impressive out of the other 17 runners that crossed the finish line. Shackleford may be at his best going a mile to 1 1/8 miles as he hit the wall inside the 1/8 pole. Shackleford will likely take a lot of monetary support if he goes in the second leg. Otherwise, it probably will be prudent to look at the fresh challengers as legitimate threats to take down the Preakness. A feature in the Daily Racing Form entries that has been a staple for decades and is now in an experimental run here in an effort to expand the horse racing betting bankrolls of all of our fine readers. Here goes nothing. The default Derby favorite after the sudden drop of Uncle Mo's stock, he has shown an impressive closing kick and will likely be leading the charge from the back of the pack. Ran an impressive race in the Lexington on my pace figures and the main knock on the fact that the field he faced not being good is probably superficial. None of these prep races has produced anything worthy of superstar status. Much like the Zito favorite, he is a dual stakes winner in 2011. He is not getting the same amont of respect due to the fact that both were tote board busting victories. The post is terrible, but he is one that could settle back on the rail and have the shortest path to the winner's circle. This one is the third choice on the morning line despite not having a stakes win to his name. He is probably going to go off at a short price for this type of spot as well with the kind of closing kick he showed in his two stakes defeats. Included this high because he is the stranger of the bunch. Aidan O'Brien rarely if ever ships over for the Derby and this one apparently is a horse he thinks can win this race. He ran second in the UAE Derby going 1 3/16 miles, so distance should not be a problem the dirt surface is another issue though. This one has been under the radar with the presence of his well known neighbor Uncle Mo. His form was flattered when Toby's Corner rebounded from the Gotham defeat to win the Wood Memorial. Up until April 9th, not a lot of people had this horse on their radar for the Derby. The defection of a few top stars in Southern California changed that outlook quite a bit. He could be coming into his own at the right time or that was a one race wonder. Either way the 10/1 line seems a bit low. Has shown the ability to rate off the speeds and has been working decently leading up to the Derby, he could be overlooked here and the value is there. How the mighty have fallen, there is a chance he may not run. Only included on here because he is the lowest in the line of probability in likely winners. A graded handicap would have all twenty runners listed, but at this point trying to make a case for the other 11 is not an easy task at all. All the ones not mentioned above either have zero form or only positive races on the synthetic surfaces with no other redeemable qualities to speak of. You kind of have to feel sorry for the public handicappers who do the graded handicap and go through this mess on a yearly basis. Derby weekend kicks off with five stakes races and the Oaks on Friday, the first post for Churchill is 10:30 in the morning. The La Troienne (older fillies and mares, route), Edgewood (three year old fillies, grass route), Eight Belles (three year old fillies, sprint), Alysheba (older males, route), American Turf (three year olds, grass route), and the Kentucky Oaks are the stakes races on hand for this day of racing. Arguably the best race featured on the card with the rematch of the one-two finishers from the Breeders’ Cup Distaff from last year. The rematch of Unrivaled Belle and Blind Luck doesn’t have the same luster that it would back in December or January due to the fact that both have combined for four losses since that November night. Blind Luck contributed with three of those four loses. In two of those loses she was up against a lone leader who controlled the race from start to finish and the most recent loss to long time rival Havre De Grace, who has come into her own in her four year old season with two stakes wins so far. The three out of the supporting cast that could have a chance at making an impact is Quiet Giant, All Due Respect, and Absinthe Minded. All three also will likely contribute to the pace scenario as well. Quiet Giant ran some big numbers over the winter at Aqueduct although it was against a weaker bunch than at other locales. All Due Respect is exiting from the extremely competitive Gulfstream meet where she ran a big race against Florida bred runners. Three out of her four wins have been against allowance fields in addition to her stakes victory and will need to step up big to win here. Absinthe Minded was part of the Lukas stable that led the Oaklawn meet in wins. A six pound shift in the weights against Blind Luck and a shift to an outside post could make a difference in the outcome here. 2000 Breeders’ Cup Filly & Mare Turf winner Perfect Sting is represented here with Smart Sting, who is unbeaten in two starts. The sire of Smart Sting is Smart Strike, this filly is bred to do anything. Sassy’s Dream has shown some decent closing kick in two of his last three on the lawn, if she holds at the 8-1 morning line she will be a decent value play in this race. Fame by association here; Arienza faced top class filly Joyful victory, Pomeroys Pistol was up against R Heat Lightning, and Honey Chile was competing against Turbulent Descent in her latest. Two interesting runners in here are Home Sweet Aspen and Holiday Flare, both are stepping up to graded stakes company after preliminary condition wins. Home Sweet Aspen is coming off a maiden score and has a pedigree geared for speed. Holiday Flare ran fast breaking her maiden and then ran evenly in her allowance score, with Pletcher training this one the odds will probably be depressed. Toby’s Corner may not be going in the Derby, but New York stalwart Icabad Crane is entered in this spot. Coming off of back to back state bred triumphs Graham Motion and company are rolling the dice here for the winner’s share of the $300,000 purse. The shipping in from Fair Hill for a race angle is in effect here and it has paid off in the past with some decent prices. Regal Ransom’s last year may have been a complete wash with three poor finishes in three stakes race, but he comes in to this race with some foundation. His first start of the year was at Gulfstream in a sprint stakes race against Capt. Candyman Can, a multiple time stakes winner. In that race Regal Ransom broke from the rail, was behind the eight ball the whole way, and just missed for the win. The jewel in the crown of the Friday card. Joyful Victory has reeled off two dominant wins at Oaklawn since the layoff from the Breeders’ Cup Juvenile Fillies. Lilacs and Lace wired the Ashland field at 48-1 and now has to prove she can run on dirt. If Kathmanblu had won the Ashland more than likely she would be an overwhelming favorite here, she could be had at a price here off of that defeat. Zazu was in the Santa Anita Oaks, which had Turbulent Descent win her next start at Keeneland and the race was running identical fractions to the Santa Anita Handicap on the same day. Plum Pretty won by 25 lengths in her recent outing at Sunland Park upstaging her male counterparts that ran in the Sunland Derby. Much like the American Turf Stakes, this race is wide open. There is double wagering on the last two stakes races and a longshot in either or both would make for a nice cap off to the day. Derby week is upon us, it is a cornucopia of the good and the bad encompassed in one weekend at Churchill. It used to be that the Kentucky Derby and the other Triple Crown events were the definitive weekends in the sport. With advent of simulcast racing and multi-million dollar purse days at racetracks, the Triple Crown has lost some impact as the center of the racing universe. One thing remains certain though, the Derby is still the best known and heaviest bet race on the calendar year with the exception of a Triple Crown bid and the two dollar souvenir ticket bonanza that happens that day at Belmont Park. Despite the fact there is 12 to 13 races on a Derby card, the only race that is remembered is the main event. Despite the fact there has been some decent horse that have competed on that weekend, last year Rachel Alexandra was in an all out stretch duel with the eventual Breeders’ Cup Distaff winner Unrivaled Belle. In 2004 reigning horse of the year Azeri was on the Derby undercard as well and was also in an all stretch duel and was defeated at short odds. The undercards of the Oaks and Derby get lost in the shuffle, yet they are always loaded with talent that end up going places later in they year. It is frustrating, because of the fact if the public got familiar with the divisions other than the three-year-old group maybe there would be increased interest in the sport. Maybe with the NBC affiliates picking up the races leading up to the big race there could be some prolonged interest in the sport outside of the big days. Some call the infield of Churchill the biggest party of the year, it looks more like people that are there just to get drunk and don’t follow the races to me. When ESPN used to do the follow up coverage to the Derby, they would send a reporter (usually in their 20’s and a female) to the infield for what could be described best as small talk with really drunk people. It is actually a bit of surprise that the reporter was never treated like the one that was abused in Egypt during the revolution, even with the influence of alcohol. It would be nice to see the racing coverage divert to the races on hand and not the frat house guy who can down a 30 case of Natty Ice or the celebrities on hand who wouldn’t know Seattle Slew from Zippy Chippy. It would be nice to see this happen, but it is highly unlikely. Look at all that good racing, it makes you feel cheated doesn’t it? Yes, after enduring months of $7,500 non winners of two lifetime claimers and racing cards with five state bred maiden claimers you the horseplayer get an overload of high quality races with juiced up pools. Churchill has twelve graded stakes races with varying divisions on tap over the course of two days and as many wagering pools as the mind can dream of. Be warned though, the letdown from these types of days is tremendous. 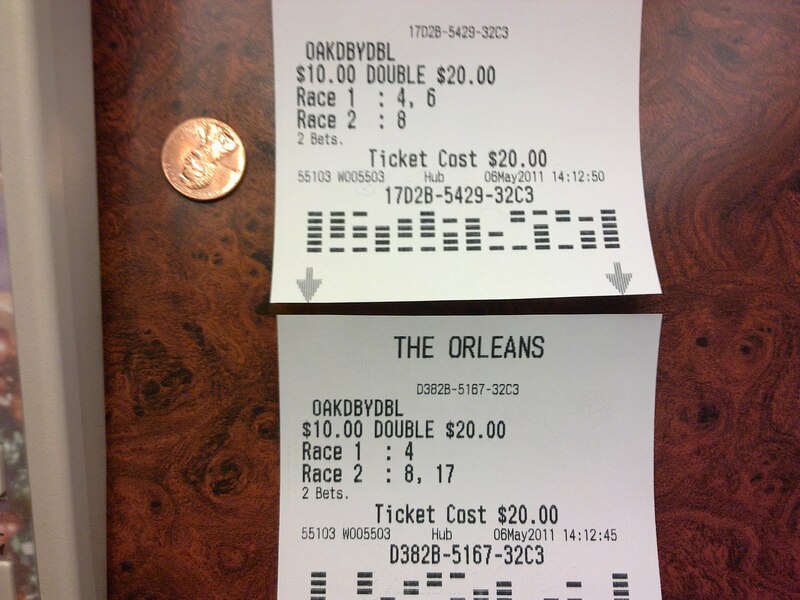 It is like taking a vacation from work and having to come back to work on Monday when you look at the Sunday card at Belmont following the two big days at Churchill. This is the only time of the year it is considered all right to drink mint juleps. That sticky sweet concoction using bourbon and mint leaves is considered a really bad drink 364 days of the year and this is the one day can drink it without getting a weird look from your bartender or the patrons at the bar. Maker’s Mark produces a blend of their bourbon that is mint julep flavored, finding it is near impossible in NY, because no one in their right mind would drink this on any other day than the first Saturday in May.